Love this article from Kohler on six of the hazards you want to avoid when remodeling your kitchen. Title: 6 Kitchen-Planning Myths. I’ll list the topics here, but go to Kohler to read the article! Myth#1 :”I can add that easily at a later time.” ~ Maybe not! See what Kohler says. Myth#2: “I’m not having any clutter in my new kitchen.” ~ Hmmm . . . just where will you put that bag of flour and that big jar of sugar? Out of sight hopefully . . .
Myth#3: “Bigger is always better.” ~ Maybe not. Read the comments. Myth#4: “I don’t need a designer.” ~ Well, maybe not. But be sure before proceeding. Remodeling your kitchen is like squeezing the toothpaste out of the tube – once its done, you can’t put it back the way it was. Myth#5: “Yes, it will fit.” ~ Maybe, maybe not! Myth#6: “I want what she has.” ~ Not all houses are the same, nor are all tastes. What is that, you say? What is there about your house that you KNOW needs updating or replacing with something that looks good and works! Do you have pets? What about that doggy door that you bought from . . . wherever. Now is the time to have a custom-made door that actually fits the opening, looks good and operates easily. This faucet is ADA compliant, but is stylish and easy for anyone to use. The higher than normal outlet is a plus. The design combines beveled edges and curved bases for a style to fit any bathroom. What about Kitchen or bath knobs and pulls: Whether your style is sleek and modern, or antique and ornate, new knobs and pulls can do wonders for a cabinet. Yes, I borrowed the title of this posting from www.kitchenremodelideas.com. 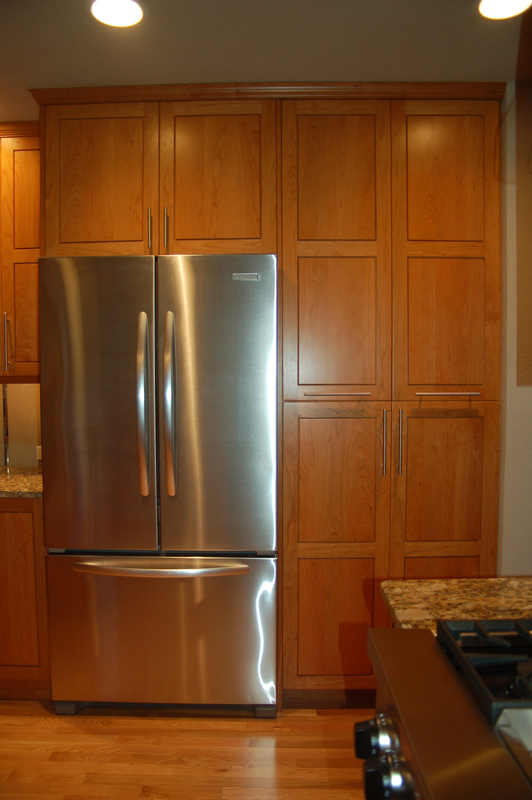 They have lots of photos and suggestions for the hard-to-design kitchen or bath. If adding or moving windows and walls are not in your budget, then re-designs can be problematic. 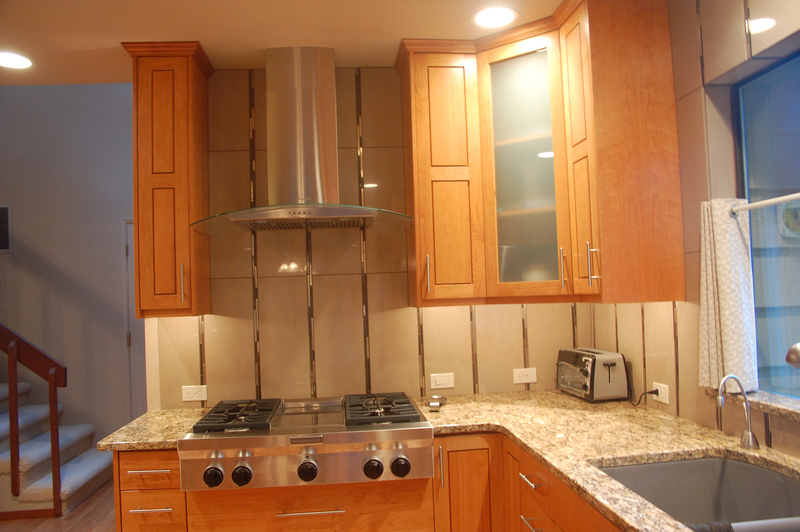 You need creativity and flexibility to make the perfect kitchen or bath. This photo is borrowed from www.kitchenrodelideas.com/latest-trends/live-in-kitchen/ The open layout allows a busy homeowner to prepare a meal while helping the kids with their homework. Versatile! While opening up that kitchen, don’t forget the small touches that make such a difference – tiled backsplashes in warm colors and interesting patterns are one of these “little things”. What would your ideal kitchen be? Kitchens.com has a collection of slideshows showing off unique kitchens, each very different from the others. I love rustic motifs, so I’ve included one of kitchen.com’s rustic style kitchens. They have many more on their website, so I urge you to go there and stroll through the photos for ideas, if this is your style. They have a great many styles, so even if rustic is not your thing, check them out for inspiration. 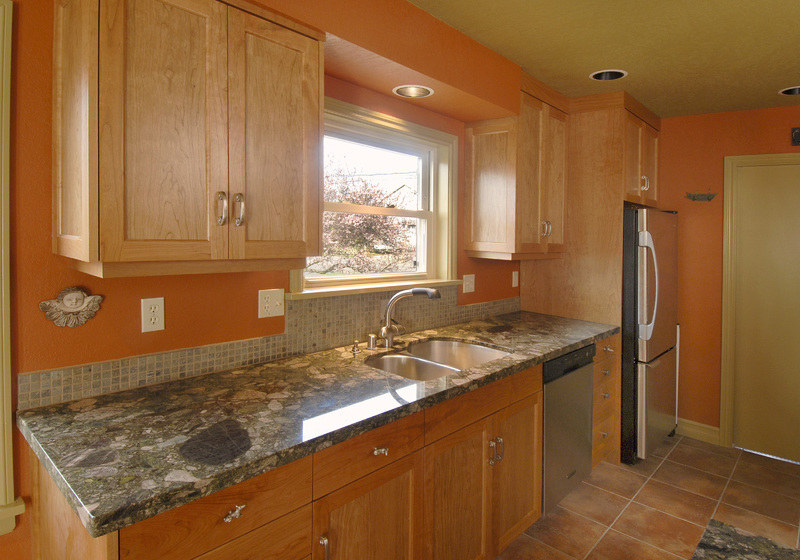 Step outside the box and be creative with your kitchen remodel. Kohler has an interesting sink, with matching backsplash tiles. 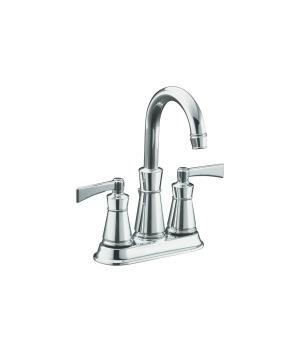 The faucet is “Revival” shown on the Kohler website. I like the comments I will copy below, from Kohlers article’s “Finding your unique vision” advice on how to design your kitchen (or your new home!). “You can’t ignore the volumes of inspiration that are published in shelter magazines, catalogs and on the Internet. Earmark your favorites and save them for help with style decisions. “Fragola says that during her kitchen remodel she relied heavily on a “foot-and-a-half stack of dog-eared magazines.” These inspirations helped her and her husband Joe convey their vision to their architect. “We took in as much design info as we could and then figured out what resonated for us,” Fragola explains. This is a beautiful countertop we installed for a client recently. The colors and textures are a great centerpiece for the kitchen. 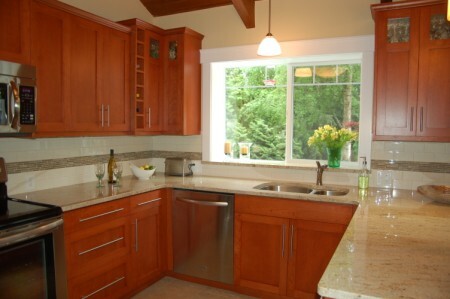 This is a beautiful kitchen we completed recently, with cherry cabinets in shaker style and Shivikasi yellow granite countertops. 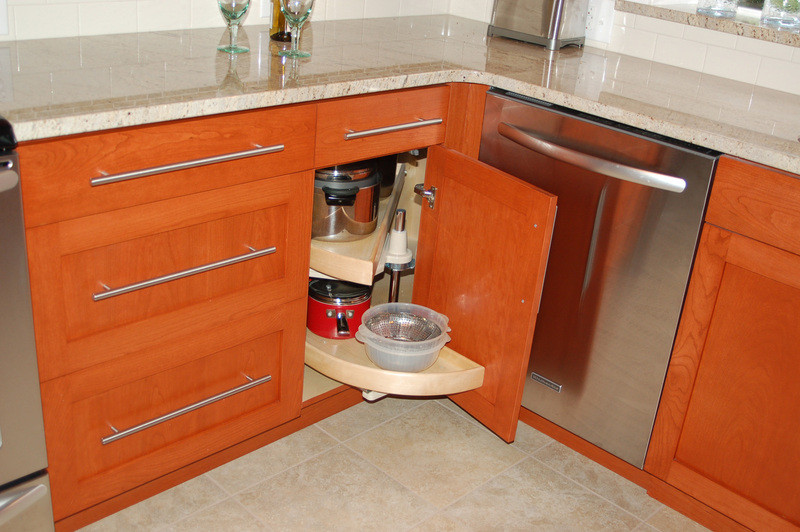 The corner cabinets have nifty rotating shelves to access as much of the corner space as possible. 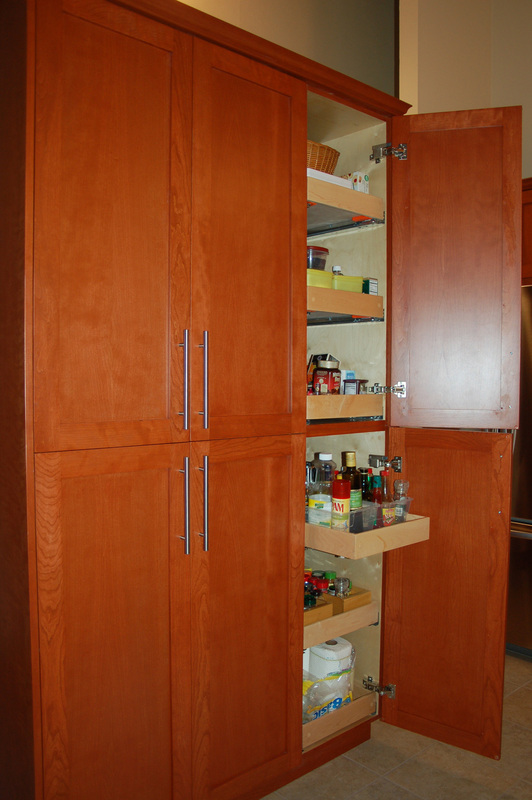 Full height cabinets with pull out drawers. There is wonderful storage capacity in the full height cabinets with very convenient pull out drawers behind the cabinet doors. Think about your kitchen and what you would like to see there!